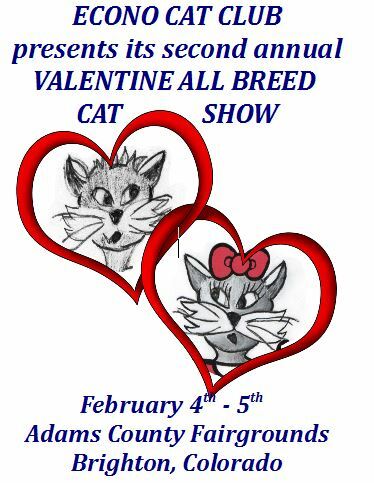 Our first show was in January, 2013. New Year's Party . . .
encouraging costumes among the entries. we added a second logo as a love interest. The Hello Summer Kitty Show was in June, 2016. For this, we dressed our Logo in a Hello Kitty outfit. smoothest running show so far. Manager, and Catalog Artist, became our Entry Clerk. if I hadn't accidentally chopped ten years from the date. 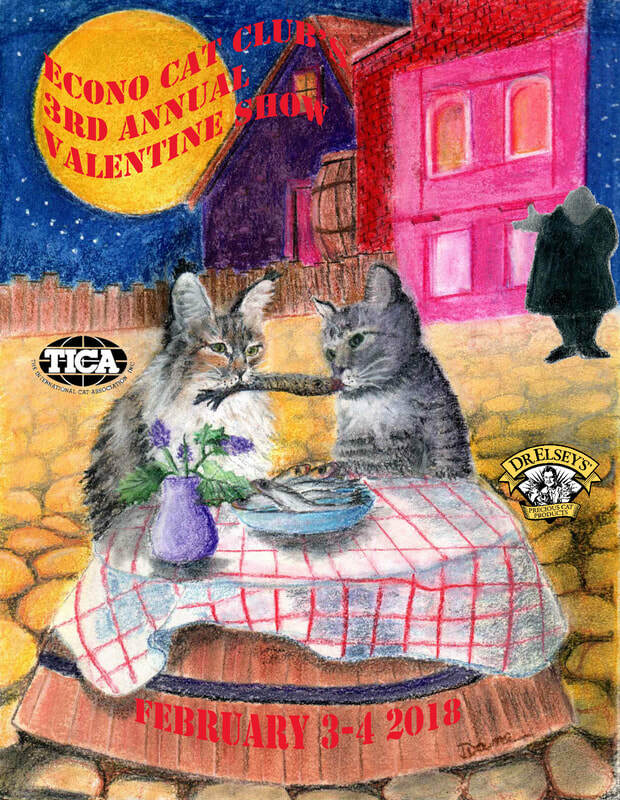 When we planned Show #8, our third Valentine Show, we discussed adding spaghetti to our lunch menu, which led to a feline version of "Lady and the Tramp" on our cover. The spaghetti idea never panned out, but our Catalog author did initiate a new idea: an interactive catalog with 26 QR links that can be read by the bar code reader of your mobile phones, leading you to playful and informative cat websites featuring music, products, medical advice, etc. For our tenth show, we were honored to be chosen by TICA to host The South Central Regional. We chose the theme "Starry Starry Night," and our Artist in Residence, Diane, researched Vincent Van Gogh's biographies and artwork so she could fill our catalog and flyers with Van Goghesque designs and color, while I contacted our logo's brother from Holland, Vincent Van Kitty.